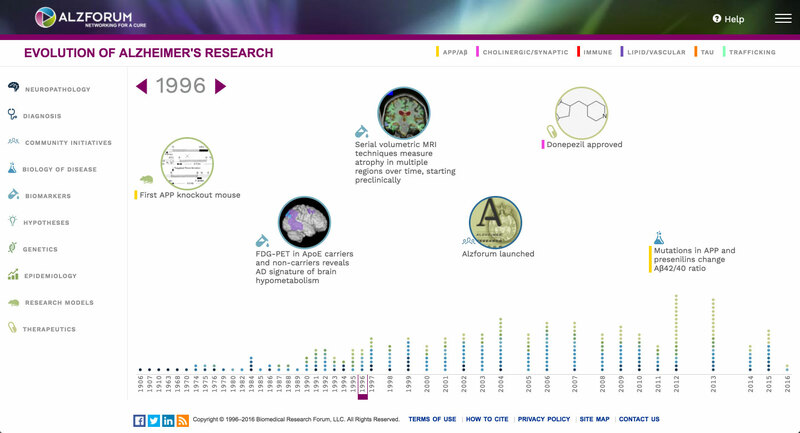 To mark the 20th anniversary of Alzforum's launch in 1996, we have compiled a timeline reflecting the evolution of Alzheimer’s disease research, starting from Alois Alzheimer's public presentation of Auguste Deter's case in 1906 in Tuebingen. 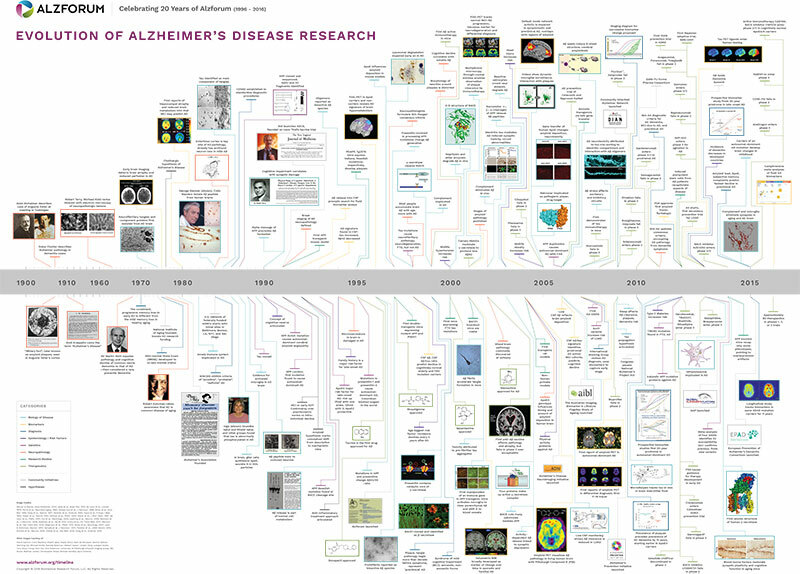 The timeline marks the milestones that have stood the test of time, as well as the prominent debates and organizational advances that transformed Alzheimer’s science from the backwater it once was to the substantial, diversified field it has become. Below, click to enter the interactive online version or download the poster. Click above to enter the timeline. Click individual items to open a popup window. In its Media tab, find historical visuals, e.g. the first tau tangles isolated from human brain. In its References tab, find citations with links to PubMed and other primary sources, as well as further reading on Alzforum. Items are indexed by research topic (color bar; legend at the top), and category (color icon; legend at left). Selecting a topic or a category will highlight the relevant events, shade all others, and allow for a filtered scroll across major developments in that one topic or category, e.g. all milestones in biomarkers or APP/Aβ. The total number of events: 271. Navigate through the timeline by clicking purple arrowheads, or dragging the purple year box at bottom.